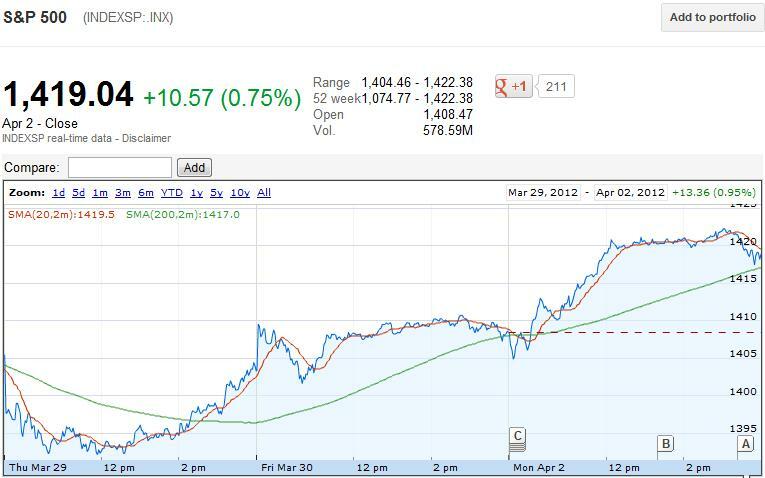 Technical level for S&P500, Dow and Nasdaq for April 3rd. Today stock rallied on good ISM data. Really ? Today was just an example how shorts are losing money in this market with just mediocre data. Eurozone PMI showed 8 month of contraction and their unemployment rate hit 10.8% which is now at 14 year high. With such data Eurozone crisis will only get worse but the mainstream media ignored it completely as the stock went for crazy rally with mediocre data from US with bad construction spending data and ISM mfg beating expectation. Once again I am not convinced with the rally, ISM manufacturing data has been coming out in this range since August 2011. Infact if you look at the past data of ISM mfg chart, it were much stronger but stock market never broke multi year high. Anyways just follow the market or ignore this market and don't hold any stock overnight if possible. The technical level to watch out for April 3rd is as follow: The chart once again looks bearish. FOMC meeting at 2 pm EST is still big mover. For bearish sentiment to continue, Dow needs to break 13240 level, S&P500 needs to break 1314 level and Nasdaq needs to break 3106 level and close below that level. For bullish sentiment to continue, Dow needs to break 13290 level, S&P500 needs to break 1321 level and Nasdaq needs to break 3121 level and close above that level. For 2008 crash like scenario, Dow needs to break 12099 point, S&P500 needs to break 1267, ans Nasdaq needs to break 2704 point, which at the moment looks impossible. 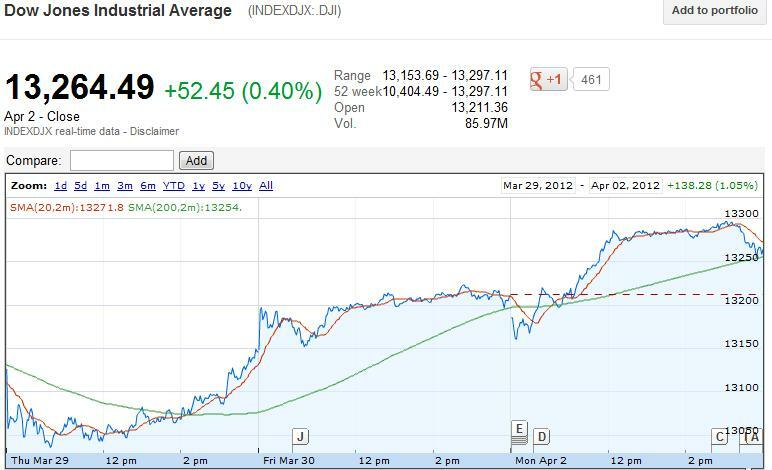 Dow Chart looks bearish for April 3rd. If red line crosses green line and stay below green line then its bearish signal. If red line crosses green line and stays above green line then its bullish signal. .
S&P500 chart also look bearish for April 3rd. If red line crosses green line and stay below green line then its bearish signal. If red line crosses green line and stays above green line then its bullish signal. Stocks I am watching for tomorrow is puts in AAPL, GOOG, MA, PCLN, V, FAS, DIA, SPY for option trading and for day trading, UVXY, KERX, MM, HGSI, FSLR. The manipulation is not over yet and its not likely to happen soon. Remember this Friday stock market will be closed and non farm payroll will come out on Friday, so futures data will decide fate for coming Monday. So take appropriate position accordingly.